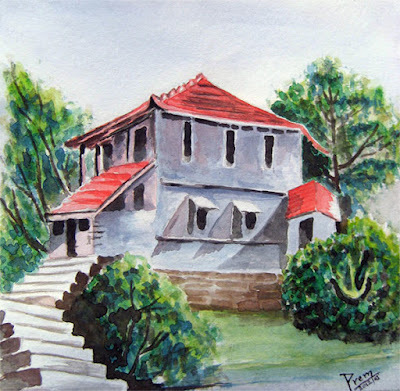 My new paintings, which I am sharing with you in this post, in my opinion, have gotten better than most of my previous works in terms of watercolor use. The problems I used to encounter while using watercolors in the past have resolved to some extent after I learnt color-mixing and working in different layers. This taught me a good lesson to research about how to paint effectively and efficiently in the chosen medium prior to starting the real work. I drew this painting in a 20 x 21 cm sheet of paper from a poster reference. The trees were a bit difficult but the mix of burnt sienna, prussian blue and yellow colors worked fine. I used red and blue colors to produce the purple walls and that too worked well. With this painting, I have got a lesson about how to purchase watercolor in the future. I am going to purchase only the basic and most useful colors. For example, I will not be buying green, purple and possibly black colors anymore. They can be barely used directly. This one is a more recent work, where I have painted the mountains, houses and trees. 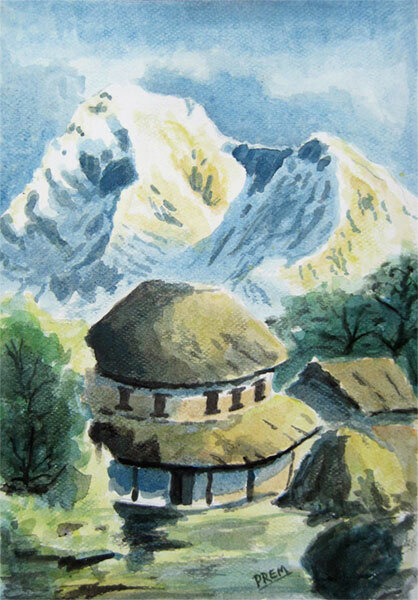 The traditional houses, as such, are found in the rural or the village areas of hilly region. With these watercolor paintings, my confidence on using watercolor has risen significantly. I hope I will be more time efficient while using watercolors in my coming works. This one came out great, Prem! Thanks Jake. I hope you are the same Jake at WetCanvas!